This is a scree-ride down the face of Molochian skyscrapers, a hyperactive skulk in the Parisian labyrinth that Haussmann destroyed, a prose whirl between the Imaginary and the Real cities, never quite sure where the border is to be crossed. Darran Anderson has achieved wonders in this nigh-on 600 page thundering through utopian fantasies and apocalyptic full stops; those gentle walled perfections that became extermination camps, those absurd monster movies that all came true to Baghdad’s Shock and Awe. 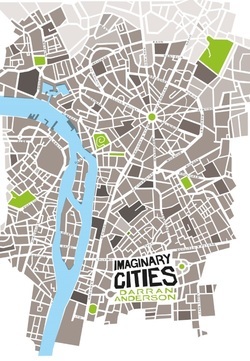 Anderson bumper-cars the reader from pessimism to small sparks of hope, all the time banking the poetry of urban pseudo-history: “cities where the inhabitants are perpetually drunk.... where marriages are arranged between ghosts”. Houses built on turntables, skinned pyramids, “a marble Tron”, Fordlandia, star cities, Parthenon-copies, the hate towers of San Gimignano, New York threatened by the Stay Puft Marshmallow Man, the questionable quarrying for the Emerald City (palaces and head offices built in slave ships and plantations); “as with all imaginary cities, they have begun to seep out in the real”. In Anatole France’s ‘Penguin Island’ a colony of “mistakenly baptised” penguins begin to make a civilisation, biting noses and pounding heads. And for all we might scorn the superstitious fears and empire-building in the sky that have served as blueprints for earthbound architectures, they are no different from the Objectivism of Ayn Rand that drives the Moloch-populists of contemporary US Republicanism with their dreams of bombing Iran back to the ‘Stone Age’ and re-building ‘Celebration’ there. There are so many wonders in this book – partitions knocked down, cities that walk, Temples of Silence, pasts abolished, Kowloon’s Walled City (so recently gone, it seems impossible to have been), secret cities under No Man’s Land – and yet inside every one of them there is something like those Aka Manto and Hanako-san ghouls that patrol the lavatories of Tokyo, ready to turn a service into a charnel house, a freeway into a prison gate. Imaginary Cities is a fabulous hallucination, but it drags into question the efficacy of utopian – and, indeed, any futurist – thinking about ‘cities’. The paradox of the city, perhaps, is that while dancing on a safety net held by thousands of others, the citi-zen’s most precious quality is their individual ‘inner’ life. When the city steals a citizen’s eccentricity for itself, Godzilla comes.